Despite being a big nail varnish fan there are several brands that I still haven't tried. I'd love to be able to try at least one varnish from each brand to see which brands are the best to invest in, but that's a little on the expensive side. One nail varnish brand that I hadn't tried yet was Zoya, but I've recently tried a couple of varnishes from their new Spring/Summer 2014 ranges. Zoya have over 500 different shades available and all of their nail varnishes are Toluene, Formaldehyde, DBP and Camphor free. They're also 100% organic and vegetarian and vegan friendly. Kirtridge* is from the Tickled collection which features six full coverage shades with a creamy finish. The other shades available in this range include a lime green, medium blue, deep pink, a coral and a slightly orangey looking red. Kirtridge is a pastel baby pink colour. As with most creamy pastel shades the formula wasn't the easiest to apply but this was probably one of the best I've tried and it wasn't too difficult to try and apply it neatly. The swatch above has two coats and this is fully opaque, so as long as you've applied it carefully you could stop there or you could apply another coat to make sure its perfect and deepen the colour. Without a top coat this has a nice shine to it but if you do want a proper glossy finish you will need to use a top coat. I only had this on for a couple of days before I removed it but I would say even on my nail varnish destructing nails I could have got 2/3 days out of this without chipping. Alma* is from the Bubbly collection which features six holographic glitter shades. The other shades include a deepish grass green, medium/dark blue, a purple, a pink/red and one that looks similar to Alma but lighter. 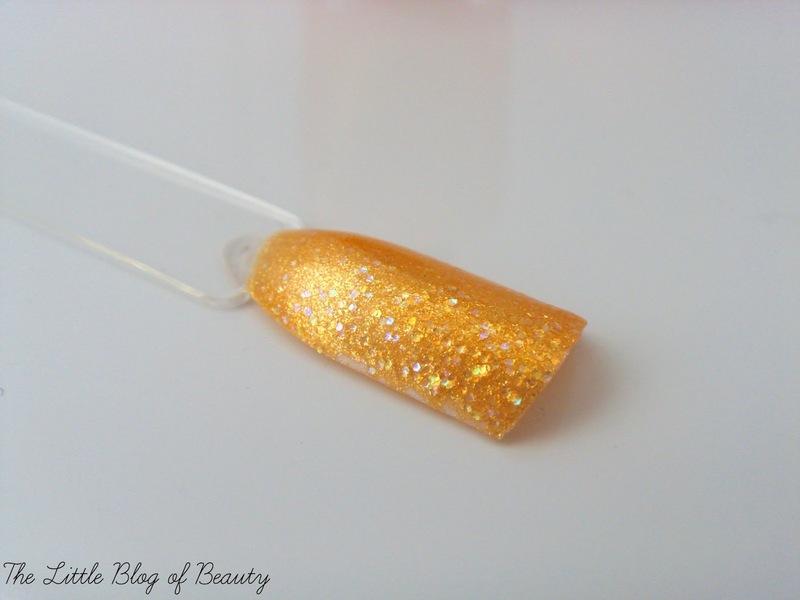 Alma is described by Zoya as a golden peach and I think I probably agree with this, it's a little bit like a sparkly satsuma. It's a very beautiful colour but unfortunately yellow and orange nail varnishes don't very often suit me, although I did get several compliments on this when I went for my beauty personal shopper experience at Selfridges Birmingham. This isn't one you can apply on its own as it's not a full coverage glitter so you do need to apply a base colour underneath. 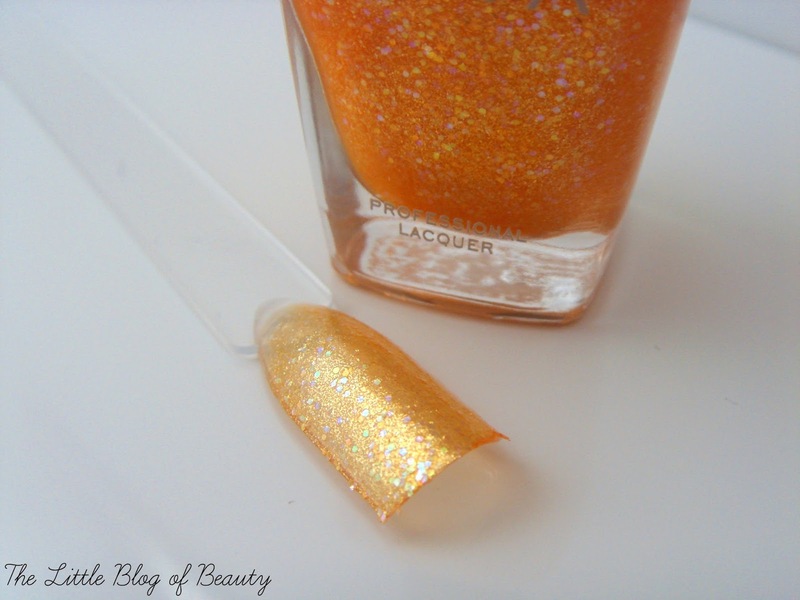 The swatch above next to the bottle is just the glitter nail varnish on its own and although it doesn't look too bad in the picture it's very thin and you'd still be able to see your nail. For the swatch on its own I applied a creamy/pearl off-white base (Barry M Pearl from the silk collection) and this really bought it to life making it opaque and the colour appear much brighter. Surprisingly for a glitter nail varnish this actually has a very smooth finish to it and you could easily just leave it as it is and it wouldn't catch, but I did apply a top coat as I rarely go without one. On my nails I think I got about 3 days wear out of this before chips started to appear. As a glitter this is obviously more difficult to remove than a standard nail varnish but I actually didn't find it too bad. I just hold the pad down on the nail for a while (effectively soaking it off I guess) and then most of it can be wiped away. Price wise Zoya varnishes are £11 each, so around the same as an OPI or Leighton Denny varnish. Although this is a little expensive for me to spend on a nail varnish at the moment I would definitely consider getting more in the future. 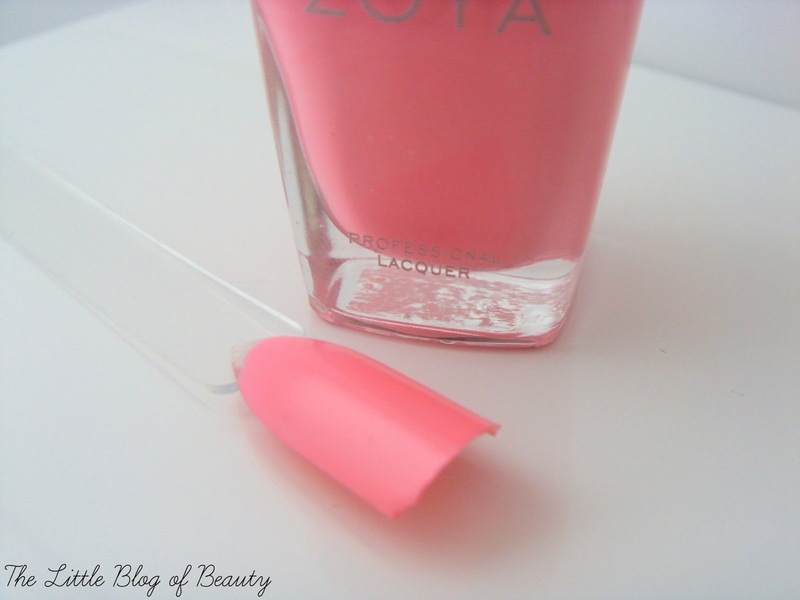 Have you tried a Zoya nail varnish?